I Was Featured in This Etsy Treasury! I wanted to share this great treasury that one of my graduation cards was featured in! I found a new place to try to sell my handmade items today. It is called Craft Is Art. I am not sure how well it is known yet, but it was free to start. They just take a percentage if you sell something. I guess if it gets well known then I may stick with this site...then I don't have to pay the fees that Etsy has. I have only put one card on there as of now but I will be starting to add more things soon! You can put up to 25 items in you shop for free! But here is the link, if you would like to check it out! To all a good night and happy crafting! Etsy Greetings 5 Spot Sale! TODAY ONLY!! 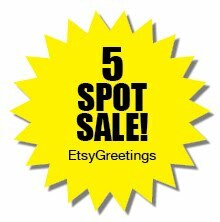 Etsy Greetings 5 Spot Sale! The anticipation is over. The doors have opened on a beautiful saturday morning. Today only! Be the first to snag that great one of a kind greeting card and receive $5 bucks. Great deals going on now! Hurry sale ends midnight tonite! Visit www.Etsygreetings.blogspot.com for all the participating shops on Etsy! My shop is included in the list!. The more you buy the more you save. The EtsyGreetings sale is tomorrow, so I figured I had better make a few new cards. I decided because graduations are going to begin soon I would do some of my owls with a little graduation cap on! I think they turned out cute if I can say so myself! :) I have made them customizable. You can change the color of the cap to fit your school if you like...or just take it as is. I can also change them to fit boy or girl by adding flowers or taking them away. Whatever you like. As you can see by my picture added, I also ended up getting a new camera. It was on clearance at WalMart...so I decided I would get it for a back up...who knows when my other camera will be fixed! I also finished the baby shower invitations and sent those out yesterday! I hope they get to the customer safe and sound!! You like a sale? Are you a bargain hunter? Heads up then! your next purchase of $10 or more. One day only! The more you shop the more you save. Can't wait? Me either. Here's an inside scoop on how to be the first to 'snag' that awesome one of a kind card and receive $5 back for it. Sounds great to me. Here's how you do it. 1. Visit etsygreetings.blogspot.com a.s.a.p. for a listing of the participating shops. 2. Browse through all the awesome items. Heart any and all items you love. That way you can be the first to purchase some of the best cards Etsy Greetings has to offer. It will be worth your while. I guarantee it! Have fun snagging them deals! Today I found my camera on the floor next to my craft table. I just had this gut feeling it was broke before I even picked it up. So now I have to send it out to have it fixed. I like my camera...it took me a while to find one that I really liked. It's an Olympus with a lens that comes out. That is the part that broke. It keeps saying zoom error. Unfortunately I use that camera for my pictures on Etsy. It will be a couple weeks before I get it back. UGH! Trina Gueck Wins Herself an Owl Applique!!! Well the number that random.org picked was 258 and Trina had 226 so she was the winner! Good pick Trina! She will win one of my little owl appliques. Thanks again to everyone who entered! I will have another drawing when I reach 750 fans! That will be another great fan milestone! Guess what everyone!? I have 600 fans on my HollyCraft Facebook fan page now!!!! Woot! woot!! Or should I say Hoot! Hoot! :) I liked the idea that CrazySocks Crochet Shop used for her giveaway...I will be doing the same! To be entered in the 600 Fan Celebration drawing,to be done tomorrow morning, in your comment, you have to guess a number from 1 to 600. Random.org will choose the random number & the person who came closest will win one of my handmade fabric owls! Please leave an email, fan page, or shop link in your reply so that I can contact you if you win. I'll probably also announce the winners on my FB page. In the process of making all my invitations for a custom order. I am doing 22 of them. 24 in case of mistakes. It is taking me awhile with all the details. I had to thread all my buttons. There were 96! I had to cut out 96 fabric leaves, 24 branches, 96 small wings for my owls, 48 owls, 24 background papers, 24 cards. Then I had to glue everything down...I'm still in the middle of doing this. So far so good! Wow it is taking awhile to get 600 fans...was at 599 then went down to 597, now back at 599...we will have that contest soon...:) Happy Crafting everyone! So close to 600 Fans on Facebook!!! Yay! I am pushing 600 fans now! So exciting! I will have a giveaway when this happens! More info on that shortly! What a busy week here at HollyCraft! My biggest order yet of 22 invites for a baby shower! And now my house has become a daycare/craft room! I am taking care of my brother's son for a couple weeks during the days and we just got a new kitten! Aaaahhhh! Call me crazy! (because I will be soon) Happy Crafting to all!!! Don't forget to check back for my contest...I have a really neat owl embellishment I will be giving for it! I decided I would start this blog to have a place where my fans could come and enter contests! I really don't know what is up with all the Facebook hoopla about the free giveaways so I thought I would just do this...hey I also have a place to share! So here we go! Thanks to all for joining!